Following on from Monday’s post, talking about the very best of full coverage foundations, today’s post is about some further mixology in the ever-lasting quest for perfect skin. I first saw Tati from Glam life Guru talk about it in a video, and a little light went off in my head. YES. You can make foundations more dewy and make them feel more comfortable on the skin by adding a drop of a light oil. Sounds obvious, but it’s so effective. Especially with some of the heavier foundations that offer excellent coverage but can be prone to looking a little flat. 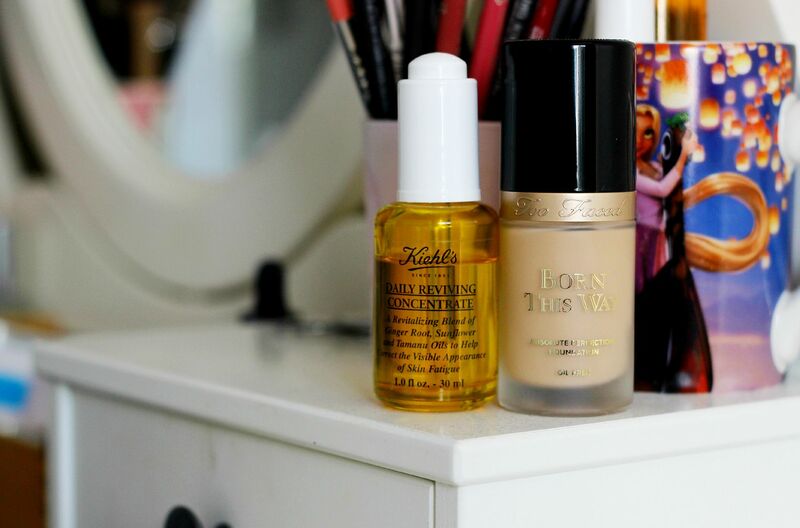 The secret is definitely less is more here though – I mix in one drop of the Kiehl’s daily reviving concentrate (see my first impressions here), which is a fantastically light yet hydrating oil with my foundation of choice – love the Too Faced born this way. I mix it up in my hand, and then blend it using my beauty blender (I know, stop talking about it already), and the foundation sits so well on the skin. If you ever have dry patches on the skin, this is the best little tip.